Not just a place to stay but an entire Texas luxury ranch vacation! Book now. Ranch w/ Lodge w/ 1 bedroom/Cabin w/2 bedrooms full of adventure & fun! Rustic Ranch meets Refined Elegance - Located in the Heart of Texas, just 2 hours by car from Forth Worth or Austin, 2 1/2 from Dallas, 3 from San Antonio and 5 1/2 from Houston, 5F Ranch offers 800 acres of fun and relaxation. A beautiful lodge and spacious cabin allows up to 12 guests. Come and stay to relish in the beauty of the rolling hills of Central Texas. Covered porches, fire pit, BBQ cooking pit, gorgeous views, sporting clays, swimming pond, fishing, pool table, Wireless internet in Lodge, photo safari, hiking, biking, historic cemetery, satellite TV. Sporting Clay Wobble is optional. $75/100 shots) bring your own shotgun and shells. Lane and Pattii have been part-owners and managers of the 5F Ranch for 14 years. Moving to the current location in 2008. They host hunters and guests year round all the while caring for the abundant wildlife on the ranch. They raise an estimated 120 whitetail deer which are for sale and breeding, a few released for hunting. They were residents of New Braunfels for 17 years prior to this and Lane sold computers for AT&T while Pattii raised their 3 children and led a bible study. The owners, Mike and Cindy, sold their previous ranch and moved closer to the beautiful Hill Country with this property. It is covered in native pecan groves and a variety of oaks. It has the Blanket Creek running through the ranch and several ponds filled with fish. There are fields of native grasses with Blackbuck Antelope, Axis, Scimitar Horned Oryx and Whitetail grazing daily. Waterbuck live in the creek bottoms and Rams roam the property. A once thriving settlement of Blanket Creek left behind an historic cemetery from the mid to late 1800's. This ranch is an amazing respite from busy life full of fun, adventure and wildlife! Our place offers hummingbird viewing in season, wildlife safari's, amazing sunrises and sunsets, a view of the Milky Way on a dark night or thousands of fireflies in early summer at dusk. Animals roam free over the entire property with exception of our deer pens that contain the sweetest deer on earth. Come feed them by hand and pet a deer or in season hold and feed a fawn! Our pond is crystal clear and spring-fed where we enjoy cooling off with a swim on a hot summer afternoon or fishing at dusk. Sometimes we go hunting for arrowheads or look for remnants of the Blanket settlement that was nearby the historic cemetery. There is always something to do and not enough time to do it in. Many nights we drink a glass of wine around the campfire and tell stories. Our back porch is huge and offers a bbq, an electric smoker, a sporting clay wobble unit and a view for miles! Maybe we will go to the gun range and shoot pistols at any one of 5 different types of targets or sight in our rifles at the 50 or 100 yard targets. Usually every afternoon we take a tour of the ranch with a cocktail and view the abundant wildlife as the sun sets in our Polaris Ranger or Kawasaki Mule. After dark there is a beautiful pool table, card table, indoor fireplace, large bar and TV in the Lodge gathering area. This ranch is a complete vacation - there is no reason to leave and you won't want to! The lodge id fully stocked with very nice dishes and utensils - we expect guests to take good care of our things please - if something breaks please tell us. Double Ovens and a Gas Burner. Big Island to prepare and serve meals. Spacious Refrigerator and Freezer. Dining table and Island Bar seat 18 for meals. Everyone loves the kitchen. Many books on Texas folklore, African adventures - hunting magazines, too! Card Table ready for bridge or poker! Beautiful table built from Colorado Mine Timbers. Play some croquet or corn hole. Kayaks and Paddle boat at the lake. Everyone Loves the covered porch. Ceiling fans help keep it cool in the summer. Overlooks fields of green with exotic and native wildlife grazing -use giant naval binoculars to watch them up close. It is a ranch so we only allow smoking outside on the porches - NO SMOKING EVER ALLOWED INSIDE! Meals can be provided and arranged for additional cost. Call and ask for menu. 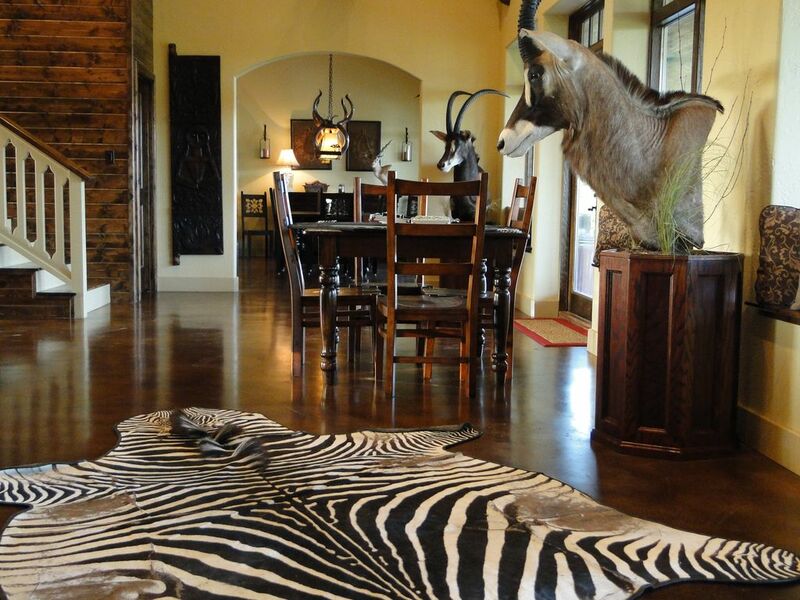 We have been entertaining guests at the ranch for years and provide wonderful gourmet meals. A massage can be provided and arranged for additional cost. No better way to end the day than to get a rubdown. Sporting Clay range is available onsite and can be arranged for additional cost, call us for availability. It is fun to step out the back porch and have your own tournament or just enjoy some fun shooting. . Hours and hours of fun beneath some HUGE pecan and oak trees. We have rented so many ranches in last few years, enjoying the solitude & view. This is the BEST by far! Patty & Lane are humble about their place, it is perfect. Enjoy the fishing, swimming, views & her cooking!! Bryan and his family were so much fun. The girls enjoyed their time with mom and dad. Good to see folks spend some quality time with their kids. Bryan even woke up at sunrise to do some fishing with an eager beaver girl. They caught all kinds of fish. Great people that we hope to see again some day. Fun Fun! We stayed at the ranch and it's always the best weekend getaway. From the food to the lodging to the hospitality of Lane and Pattii (it's like the Ritz but for hunters) there is always so much to see and do. Thank you for such a great review! We love it when y'all come visit and looking forward to your next trip! Sallie is always so much fun and full of laughter. She is such a helper. Jumps right in there and helps anyone at anytime. We can't wait to see her again. my wife and i hunted the 5 f ranch twice and had a great time on each visit.lodging,food,company where 2nd to none.hunting is strictly fair chase.some very nice animals on the property.we are looking forward to going back. We were so impressed with this ranch from the moment we pulled up to the entrance, the beautiful animals along the way to the Lodge, and entering the impressive Lodge with all of the amenities desired in a home away from home. The cabins outside the Lodge have first class accommodations and are steps to the main Lodge. There was so much to do around the ranch from viewing the amazing animals, to fishing and swimming in the lake, and sitting out by the fire pit. We had such a great time and look forward to booking our next visit. This is a fabulous hunting experience. gorgeous ranch and lodge. Lane and Patti are personable and very accommodating. For me, I just like being out in the woods. So, even though I took my deer on the first evening, Lane continued to take me out looking for coyotes and hogs. I just love the place. "WOW"... such an incredible place! Beautiful ranch, plentiful wildlife, excellent service, cozy and top comfort! You can not ask for a nicer hunting outfit or better people than the Lanings. Truly kind, loving, down to earth people. Patti is a top rate cook, Lane and Nicholas are top rate guides. We take clients on an annual hunt, and hunt ourselves as well. One Mother's Day, we took our parents o the 5F for a nice week-end get away. We look forward to this trip each year, and highly recommend 5F Ranch for any get away event! Tracy and Derek have become some of our best friends. We love to spend time with them. They are upbeat and positive and full of laughter. Spending their time together with passion. As my papa would say...."they are good people". Can't wait to see the love birds again. Day trips to Hico or Fredericksburg within 2 hour drive. Very important to read - lodge with 1 bedroom sleeps up to 4 for $350/night - the Cabin sleeps 4-8 and rents for an additional $300/night for 4 people = additional guests are $50/night. Pets may be allowed, contact property owners for details. Room deposit is non-refundable 4 day notice. Guests are required to sign a waiver recognizing that they are in the country and do not hold the property owner responsible for accidents or injuries incurred while residing or recreating onsite.